Not to be confused with State of matter. The term phase is sometimes used as a synonym for state of matter, but there can be several immiscible phases of the same state of matter. Also, the term phase is sometimes used to refer to a set of equilibrium states demarcated in terms of state variables such as pressure and temperature by a phase boundary on a phase diagram. Because phase boundaries relate to changes in the organization of matter, such as a change from liquid to solid or a more subtle change from one crystal structure to another, this latter usage is similar to the use of "phase" as a synonym for state of matter. However, the state of matter and phase diagram usages are not commensurate with the formal definition given above and the intended meaning must be determined in part from the context in which the term is used. Distinct phases may also exist within a given state of matter. As shown in the diagram for iron alloys, several phases exist for both the solid and liquid states. Phases may also be differentiated based on solubility as in polar (hydrophilic) or non-polar (hydrophobic). A mixture of water (a polar liquid) and oil (a non-polar liquid) will spontaneously separate into two phases. Water has a very low solubility (is insoluble) in oil, and oil has a low solubility in water. Solubility is the maximum amount of a solute that can dissolve in a solvent before the solute ceases to dissolve and remains in a separate phase. A mixture can separate into more than two liquid phases and the concept of phase separation extends to solids, i.e., solids can form solid solutions or crystallize into distinct crystal phases. Metal pairs that are mutually soluble can form alloys, whereas metal pairs that are mutually insoluble cannot. A typical phase diagram for a single-component material, exhibiting solid, liquid and gaseous phases. The solid green line shows the usual shape of the liquid–solid phase line. The dotted green line shows the anomalous behavior of water when the pressure increases. The triple point and the critical point are shown as red dots. Experimentally, the phase lines are relatively easy to map due to the interdependence of temperature and pressure that develops when multiple phases forms. See Gibbs' phase rule. Consider a test apparatus consisting of a closed and well insulated cylinder equipped with a piston. By charging the right amount of water and applying heat, the system can be brought to any point in the gas region of the phase diagram. If the piston is slowly lowered, the system will trace a curve of increasing temperature and pressure within the gas region of the phase diagram. At the point where gas begins to condense to liquid, the direction of the temperature and pressure curve will abruptly change to trace along the phase line until all of the water has condensed. A single material may have several distinct solid states capable of forming separate phases. Water is a well-known example of such a material. For example, water ice is ordinarily found in the hexagonal form ice Ih, but can also exist as the cubic ice Ic, the rhombohedral ice II, and many other forms. Polymorphism is the ability of a solid to exist in more than one crystal form. For pure chemical elements, polymorphism is known as allotropy. For example, diamond, graphite, and fullerenes are different allotropes of carbon. When a substance undergoes a phase transition (changes from one state of matter to another) it usually either takes up or releases energy. For example, when water evaporates, the increase in kinetic energy as the evaporating molecules escape the attractive forces of the liquid is reflected in a decrease in temperature. The energy required to induce the phase transition is taken from the internal thermal energy of the water, which cools the liquid to a lower temperature; hence evaporation is useful for cooling. See Enthalpy of vaporization. 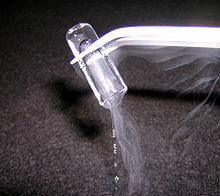 The reverse process, condensation, releases heat. The heat energy, or enthalpy, associated with a solid to liquid transition is the enthalpy of fusion and that associated with a solid to gas transition is the enthalpy of sublimation. While phases of matter are traditionally defined for systems in thermal equilibrium, work on quantum many-body localized (MBL) systems has provided a framework for defining phases out of equilibrium. MBL phases never reach thermal equilibrium, and can allow for new forms of order disallowed in equilibrium via a phenomenon known as localization protected quantum order. The transitions between different MBL phases and between MBL and thermalizing phases are novel dynamical phase transitions whose properties are active areas of research. ^ One such system is, from the top: mineral oil, silicone oil, water, aniline, perfluoro(dimethylcyclohexane), white phosphorus, gallium, and mercury. The system remains indefinitely separated at 7002318150000000000♠45 °C, where gallium and phosphorus are in the molten state. From Reichardt, C. (2006). Solvents and Solvent Effects in Organic Chemistry. Wiley-VCH. pp. 9–10. ISBN 978-3-527-60567-5. ^ This phenomenon can be used to help with catalyst recycling in Heck vinylation. See Bhanage, B.M. ; et al. (1998). "Comparison of activity and selectivity of various metal-TPPTS complex catalysts in ethylene glycol — toluene biphasic Heck vinylation reactions of iodobenzene". Tetrahedron Letters. 39 (51): 9509–9512. doi:10.1016/S0040-4039(98)02225-4. ^ Modell, Michael; Robert C. Reid (1974). Thermodynamics and Its Applications. Englewood Cliffs, NJ: Prentice-Hall. ISBN 978-0-13-914861-3. ^ Enrico Fermi (25 April 2012). Thermodynamics. Courier Corporation. ISBN 978-0-486-13485-7. ^ Clement John Adkins (14 July 1983). Equilibrium Thermodynamics. Cambridge University Press. ISBN 978-0-521-27456-2. Wikimedia Commons has media related to States of aggregation.